Here are the key ingredients for this dish though any number of substitutions for the nuts and dried fruit would be great . . .raisins, dried cranberries, cherries or apricots; almonds, pecans. . . .
I’m testing all kinds of healthy desserts for part of a series of classes I’m teaching at Columbia Sportswear this fall. I know ‘healthy’ is a terribly subjective term but I’m focusing on dishes that traditionally don’t use lots of refined sugars and flours (like these Baked Apples) or adapting ones that do, to use less of those things. 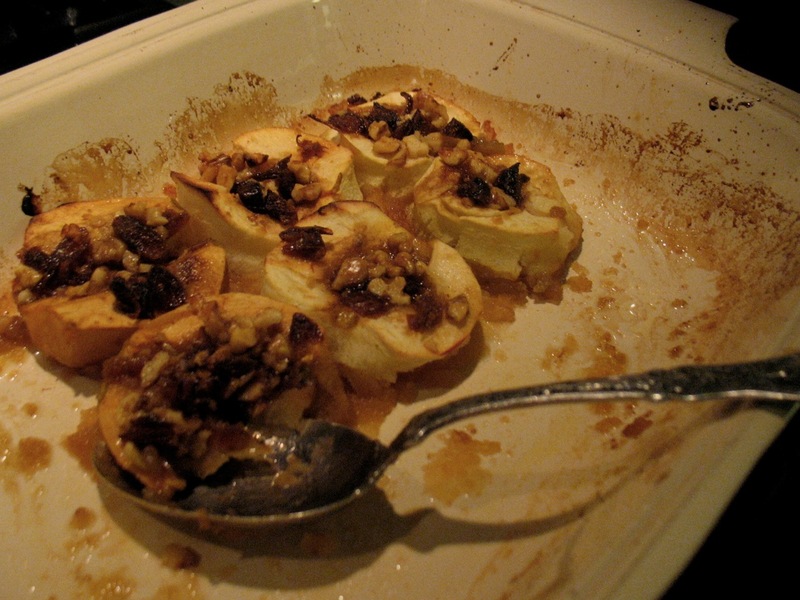 Baked Apples filled with walnuts, dates, a little butter and coconut sugar. It’s a lot of fun and I loved these apples I made last night for our dessert and loved them even more for breakfast this morning with Greek yogurt and maple syrup. Many European countries have a variation of this dish (which is also delicious with pears) and I grew up with some German renditions of this. The below recipe was loosely inspired by Dorie Greenspan’s in Around my French Table, however, I simplified it significantly. Enjoy! I’m also having fun testing soups these days in preparation for Fall Soup Class which still has a few spots. So far I think there will be a pureed chickpea soup with cumin and lemon; a leek soup; a potato chowder and a soup with different kinds of beans and greens! 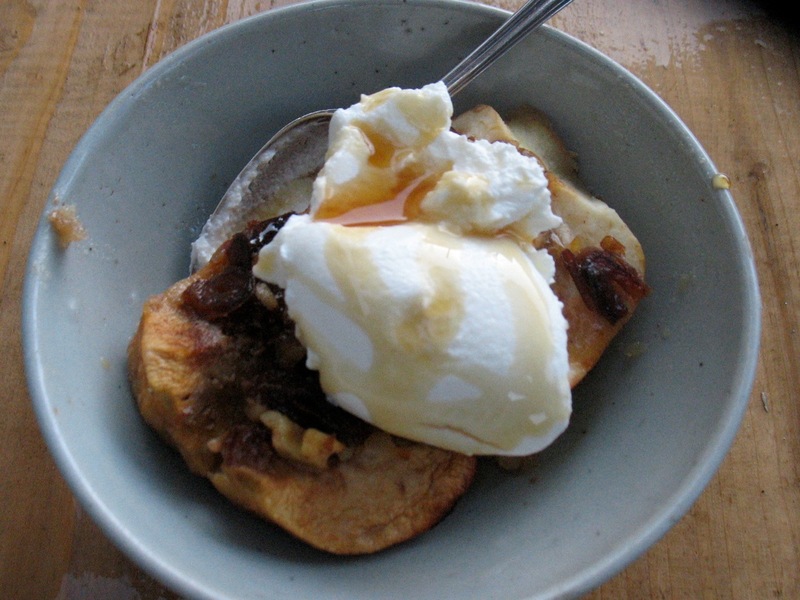 Breakfast of baked apples topped with Greek yogurt and maple syrup. 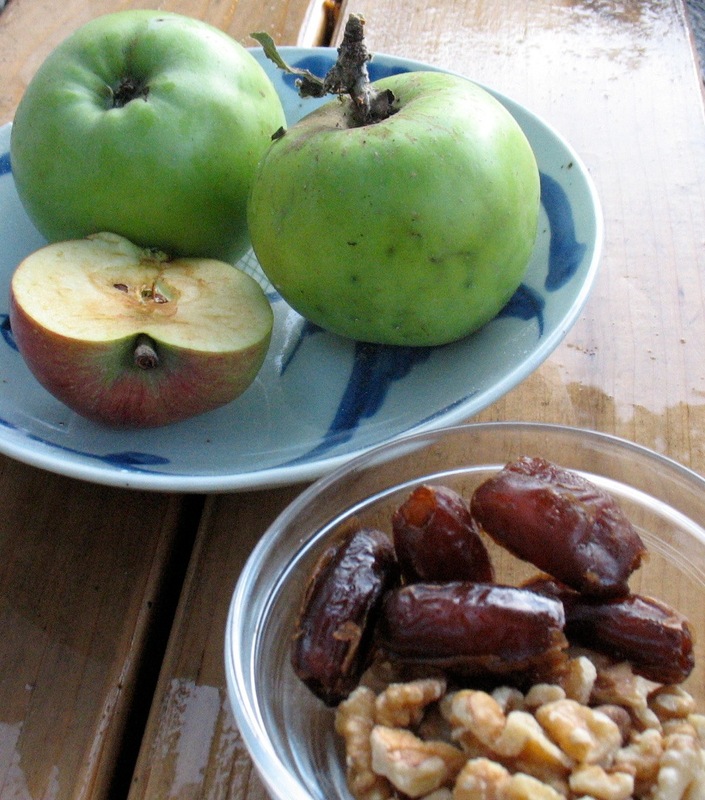 In a small bowl, mix the cinnamon, sugar (or honey), salt and nuts and dried fruit. Divide this mixture evenly among the hollows of the 8 halves. Dot each half with another piece of butter. Pour the cider or water into the pan and sprinkle the remaining butter onto the liquid in the pan. Bake until the apples are nice and tender (but not falling apart) which can be anywhere from 45 – 70 minutes depending on the size and kind of your apple. Baste with the buttery juice every 15 minutes. Let cool for a few minutes before eating or eat at room temperature as is or with Greek yogurt, sour cream, creme fraiche or whipped cream. YUM! Can’t wait to try them. Thanks again! Would maple syrup work instead of the honey or brown sugar? I have done similar with maple before…though I guess they do come out kind of runny. Hmm. Love the idea of the dates! Brilliant. Wish I was there to help you eat–I mean, test–some creations. Can you get your hands on coconut sugar? It’s awfully good for a variety of reasons. You could try it with maple syrup but it will be runnier but worth a go, I’m sure. With you were here too to try all these goodies. Miss you!